The Barrington Planning Board approved Monday night approved the proposed White Horse Pike redevelopment plan that would bring a Super Wawa to the borough, along with a space for a “high-turnover restaurant” and more. Barrington Borough Council President Kirk Popiolek opens the presentation of the White Horse Pike redevelopment proposal before the borough planning board Monday. A major aspect of the project includes extending Bell Avenue into a “two-way jughandle” with a traffic signal to allow traffic in and out of the development and the residential portion of Bell Avenue on the other side of White Horse Pike. That Bell Avenue extension will go around and behind the new Wawa. 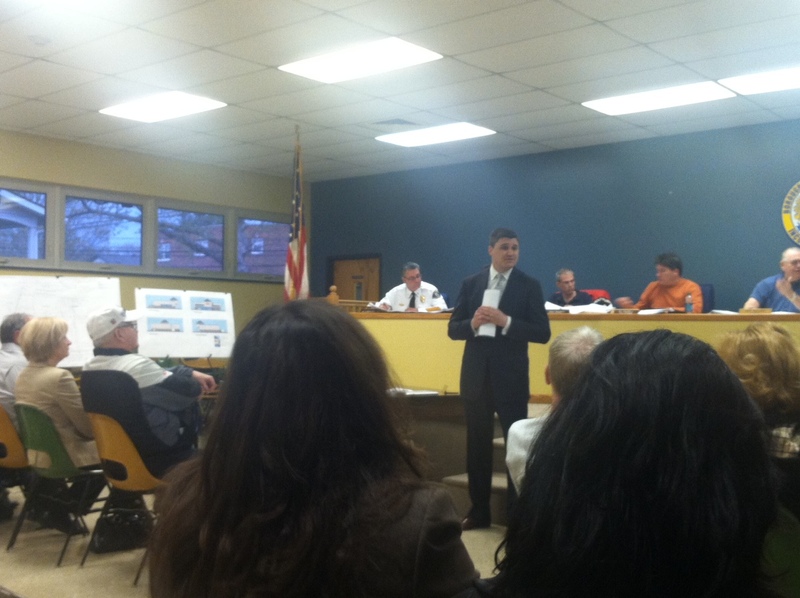 See photos of the plans for the White Horse Pike development in Barrington. In addition to signage planned for Wawa and the restaurant, the plans also call for a double-high stacked billboard (one billboard on top of the other, two sided for a total of four billboard advertising spaces) along the White Horse Pike at the corner of the Wawa property. The billboard structure would be 50 feet high with each LED-style billboard measuring 10 feet x 30 feet. The plan also calls for a space for a cell tower at the rear of the property. Two retention basins will be built to meet state Department of Environmental Protection regulations. Widen the White Horse Pike with a right-hand-turn lane onto Copley Road to allow access to Interstate 295 and a signaled left-hand-turn lane at Bell Avenue into the redevelopment area. Bok Bok Fresh restaurant would be removed; redevelopment area would reach to just next to the car wash, which will remain. Several members of the public raised questions during the 90-minute presentation and hearing, including nearby business owners who questioned the need for another gas station in the area and occupants of the business complex at the foot of the Interstate 295 exit ramp who wondered about storm runoff. Another homeowner who lives near Copley Road asked whether this “traffic magnet” would bring even more vehicles through the residential neighborhoods including Mercer, Chesterfield, Oakwood and Wayne roads. Mayor Robert Klaus noted the borough is sensitive to those issues and will watch closely. The project is under the purview of Delvo Development, which has overseen a number of Wawa installations, as well as restaurant and retail locations across South Jersey. This entry was posted on April 23, 2013 by Barrington Bulletin in Business / Money, Photos, Region and tagged development, redevelopment, white horse pike, whp.